A few weeks ago I was with a bunch of my students who were presenting their research at the annual Southwestern Psychological Association (SWPA) conference. 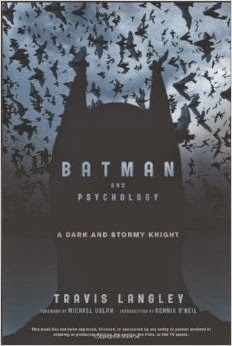 One of the invited speakers at SWPA was Travis Langley, author of the bestselling book Batman and Psychology: A Dark and Stormy Night. My colleague David and I also got to visit with Travis during a poster session where we all had students presenting their research. Here's what Travis said about the enduring popularity of Batman. Batman attracts us, according to Travis, because Batman becomes Batman by intentionally undergoing a psychological transformation. Most superheros are superheros because they are an alien (like Superman) or because something happens to them that gives them super-human abilities (like Spider-man). But Batman is different. Batman doesn't have any special abilities. Batman is Batman because he chooses to become a dark symbol, chooses to become a bat, chooses to become a vigilante. Basically, as Travis pointed out, Batman is Batman because of his psychology. Relatedly, Batman's classic adversaries don't have super-powers. Rather, they too are characterized by their own psychological quirks brought on in many cases, like Batman's, by past trauma. Thus, when Batman confronts an adversary we're not witnessing a clash of powers but a clash of psychologies, two personalities colliding. And we're drawn to the clash as we're keen to see what the adversary draws out of Batman's psyche. The iconic example of this is Batman's conflict with the Joker. The conflict between Batman and Joker is a psychological conflict, the Joker constantly probing and exploiting the darker elements in Batman's psyche. The Joker doesn't want to beat Batman up as much as he wants to pervert or destroy Batman's psychological and moral integrity. With Batman and the Joker it's a clash of wills--rooted in their respective psychological traumas--rather than a clash of super-powers. 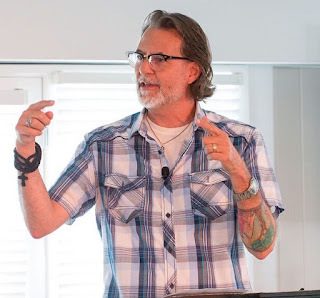 Now this might be a bit of a stretch, but as I listened to Travis describe all this about the conflict between Batman and the Joker I kept thinking about the conflict between Jesus and Satan in the gospels. Specifically, the clash between Jesus and Satan in the temptation narratives in the gospels isn't a clash between super-heroes with super-powers. We don't see Jesus and Satan throwing thunderbolts at each other from mountaintops. And Jesus and Satan don't destroy a city the way Superman and General Zod do in the recent Man of Steel movie. No, the battle between Jesus and Satan is more like the battle between Batman and the Joker. The battle between Jesus and the Satan is psychological, moral and spiritual in nature. I think that observation has important implications for how we envision what is called "spiritual warfare." The battle with the Satan is internal rather than external. The battle is moral, spiritual and psychological in nature. Satan isn't a super-villain with super-powers confronting us from the outside. Satan is more like the Joker, a force that probes and exploits the darker elements in our psyche, our fears and our perversions. What a great connection! The Joker often tries to put Batman in the position of having to kill him, when his vow is to never take a life. I feel like we are constantly tempted in this same way: do what you need to for good ends, even if the means are dirty. We mistake where the battle is. It's how we choose to fight that is the fight in spiritual contests. And where does this confrontation take place? In the desert, the wilderness, where we find ourselves alone, and the only thing we have going for us is knowing who we are...child of God; and even then, Satan can make us feel we have to jump through a few hoops to prove it. 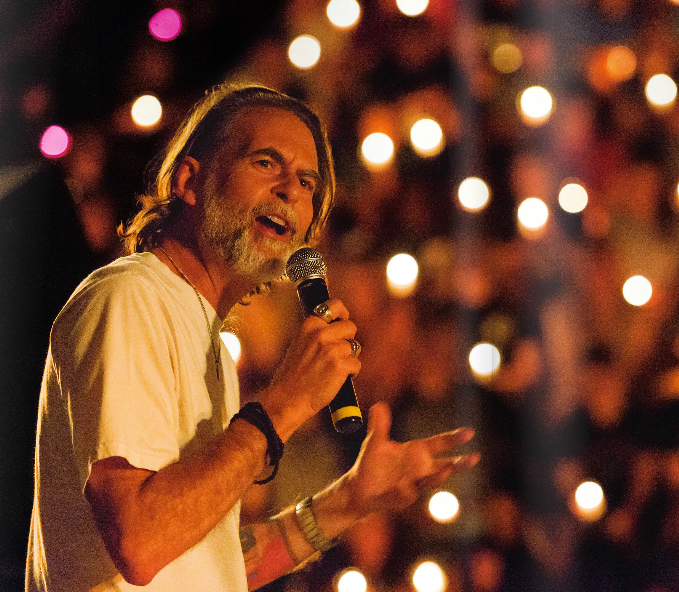 But, we live by not performing, but in giving our anointing of God a voice...we talk back. Thanks for this. My post makes it all seem very Gnostic. The political frame should be included. I think I shied away from the political aspect as seeing Batman as Jesus breaks down given how Batman goes about trying to save Gotham. What interested me, and this is not mentioned in the article, that in the film, Batman is confronted with the prospect of having to become more like the Joker in order to defeat him. That is not only interesting psychology, but even more interesting theology. Great thoughts, both in the original post, and aricclark, in your comment. I think there's something to be said in pushing the analogy out a bit further, though. Batman is a violent dude, no question there; but, his "one rule" keeps him from killing, because he doesn't want to succumb to the same evil he's trying to stop. If we're talking "The Dark Knight" film here (though I think it's a common theme elsewhere in Batman lore), what Batman is willing to do is to take on the appearance of "evil"/a killer, for the sake of Gotham's salvation (I'm thinking of his taking the fall for Harvey). Like the one hanging on the thief's hill, Batman absorbs the violence of the system in order to overcome it, and ultimately, save the people in it. Anyways, hope the analogy-pushing pans out as worthwhile. Thanks for the book suggestion! I'll have to look it up. Another good one is "Batman & Philosophy: The Dark Knight of the Soul."